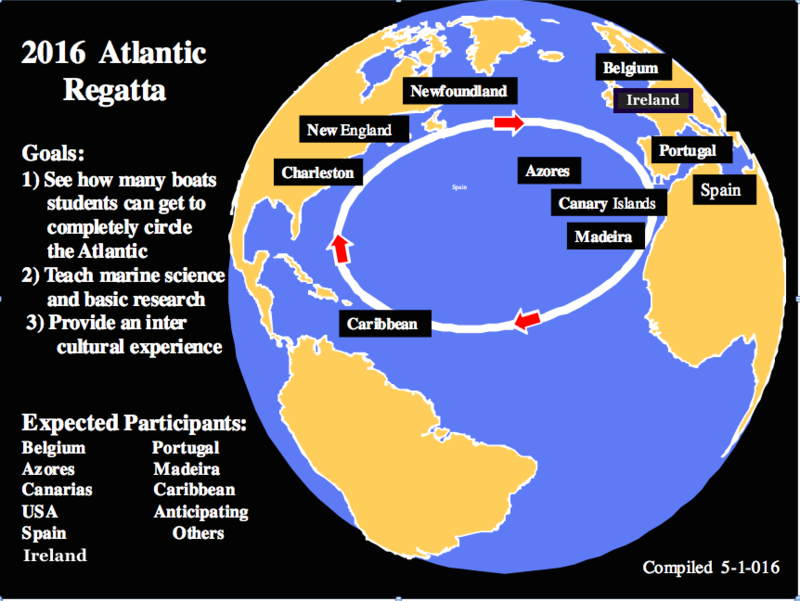 Schools from seven countries and 34 miniboats are expected to participate in the first Atlantic Miniboat Regatta, an international education project to encourage students in North America and Europe to send their boats across the Atlantic using historic sailing routes. Built of molded fiberglass and designed to be self-righting, the five-foot miniboats are powered by the wind and have a watertight compartment where students can add messages, flash drives with information about themselves, and local items for those who find them. Once the vessels land, expected in as little as three to four months for some of the boats, finders are asked to take the boat to a local school where a new group of students can become involved in the program. The boats are equipped with GPS units so they can be tracked as they sail around the Atlantic. Students can monitor their boat’s progress on a web site maintained by oceanographer Jim Manning at NOAA’s Northeast Fisheries Science Center in Falmouth, Mass. Launching is weather dependent, and some schools are still seeking partners who can launch the boat offshore. “If the boats are launched too close to shore they become trapped in coastal currents and will not get very far, but if they are launched far offshore and can get in the Gulf Stream or North Atlantic Current they have a chance,” said Manning, who has been working with Educational Passages since 2009 to track the miniboats and ocean surface drifters. Research vessels, commercial ships and fishing boats have helped launch many miniboats and drifters in the past. Twelve boats are already sailing, and 22 new boats are expected to be launched beginning in late October, including two from Massachusetts. The New Bedford Whaling Museum is sponsoring one boat, and a consortium of the Marine and Oceanographic Technology Network (MOTN), Endicott College and the City of Gloucester. A boat from the University of New Hampshire and the Seacoast Science Center, and another from the University of Maine, Orono and the Maine Coastal Program are also expected to participate. Boats launched from North America will take the northern route to Europe, while those launched in Europe will take the historic route to the Caribbean and then on to the U.S. More than 70 miniboats have been launched since 2008, some weathering hurricanes and 30-foot seas and traveling over 10,000 miles. At least two of the miniboats in the regatta will be equipped with additional sensors to provide real-time data on ocean and atmospheric conditions, such as air and sea temperature. The sensor package, developed by Bingwei Ling, a graduate student visiting NEFSC for the past year, has been installed on one of the boats and, at the time of this writing, is on a successful maiden voyage in Cape Cod Bay. The Atlantic Miniboat Regatta is sponsored by Evolution Sails and endorsed by the University of Maine, School of Marine Science in Orono; the College of Exploration in Potomac Falls, Virginia; Flanders Marine Institute in Wandelaarkaai, Belgium; and the School of Ocean Technology in the Fisheries and Marine Institute of Memorial University in Newfoundland, Canada.